Poppy-seed Hamantaschen....I used to love them. I haven't seen one in ages. If I weren't on a strict diet for son's wedding in May you would have convinced me to make some. The new quilt is so much fun. I'm still trying to figure out how you piece it all together. And yes, I hate the time change. I usually leave one clock set to the old time so I can right myself when I get lost in the day but I forgot to do it last night and now I have no idea what I'm supposed to be doing. I hate it. Love your quilts! March sure did come in like a lion, didn't it? Talk about being mixed up, we were in AZ long enough to get used to mountain time and then were home for 3 days before the time change. We should have stayed in AZ for a few more days and all would have been good. No snow, either! I don't have much trouble with the fall time change, but the spring one always hits me hard. Your crafting looks great - and those treats sound delicious! Your quilt and hat are perfection. I love all cookies. Friends always brought us Haman! I didn't use to care about the time change. I preferred Eastern Standard Time, but DST was okay too. Now, I was very much looking forward to DST. It's been a LONG grey winter and I'm loving every bit of sun I can get!!! Your quilts are both lovely. You absolutely inspire me. I am mot disturbed by the time change, but it certainly does effect all those around me. hope your snow melts fast and spring arrives! Have you decided on whether you are retiring ?? You work many many hours!!! I do struggle with the time change each season, and find it takes about a week to adjust. It's like . . . a minor case of jet lag. Your quilts are just wonderful -- I love your style! And your Hamantaschen looks delicious. What a fun idea . . . to have a tea! Oh those pastries look delicious! My Mom used to make a kind of pastry filled with poppy seed and apricot stuff. Yum! And your quilts are such fun. Usually the Spring time change botheers me for a week or so, but this year I seem to be having an easier time of it (so far....). You work way too many hours! Nice work on the quilting front! The hat is good for your tired brain; that is a lot of work in your week! And yes, I struggle with the time changes, too. 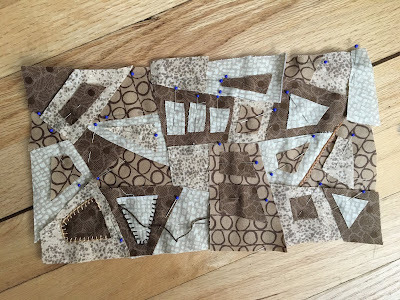 Your new project in the neutral colors is lovely: it will be fun to watch it progress. The pastries look yummy, and I know your vegan friend appreciated that you made some especially for her. Lovely quilts!! I am having a hard time with time change also. The Hamantaschen looks lovely and I bet it tastes great. I have never had those pastries. Oh I hope it warms up soon for you! I struggle with the vegan baking, I honestly avoid it. It does not bring me joy. they are very pretty. I have been exhausted as well. I think it is a combination of the heavy workload and the time change. I'm sticking with that. Your hat makes me want to knit a hat. But no!! i must focus! I love your quilts, they look perfect. And the it looks as though it would be just the job when watching the tv. I am so sorry about your work schedule, and believe me I completely understand with my regular load, five long and involved notes due and a sign language class to boot. Little B and I just finished a horrible amount of math on his computer, he continued to want to complete the program, I was not pushing him. Still my brain feels like mush. Have a wonderful Sunday and a good week ahead. Oh look at all of your things!? I wouldn't go out either and those quilts are fab. Hopefully the end is in sight with the workload - that's what I keep thinking anyway!